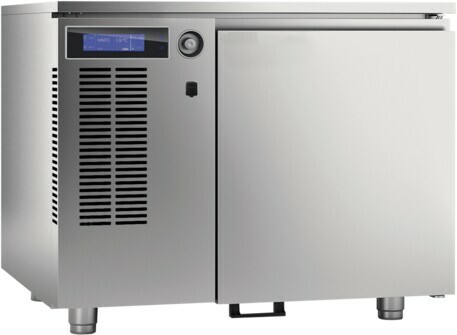 ​The Blast Freezer is designed to rapidly and uniformly decrease the temperature of hot foods to either a chilled or frozen state in order to provide enhanced food safety, longer storage life, and better production efficiency. It has a stainless steel interior and exterior finish, LCD controller with easy to use multi-lingual controls. ​The LCD controller has a USB port, encoder, multi-sector view displays interior temperature, product temperature standard (product core L-shaped probe for easy extraction) and ventilation speed. 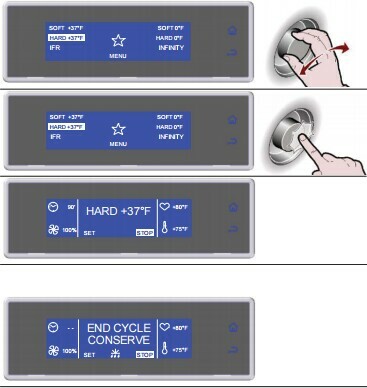 ​With 20 pre-programmed blast/chill cycles to choose from; the chilling process will take product from +194°F to +37°F in 90 minutes and the freezing process will take product from +194°F to 0°F in 240 minutes. ​Intended for low profile food products, the five sets of pan guides are adjustable in 1.6” vertical spacing intervals. The unit includes a self-closing door with full-length outer stainless steel handle on top and a bottom foot pull hook for those times when your hands are full. Each unit features adjustable feet and the latest in advanced, CFC-free polyurethane insulation. In addition, the chillers and blast freezers are constructed with state of the art Copper/aluminum corrosion resistant evaporators, and each has a door frame heater to augment the electronically controlled, electrical defrost. Powered by the specially enclosed hermetic compressor with LCD control board. The interior also includes an L-shaped probe and is climate assisted with a green conscious R-404a refrigerant. A removable magnetic door gasket, with a stainless steel exterior, stainless steel half racks and a polished stainless steel interior give the unit an easy to clean and sleek finished look. All units are ETL Safety & Sanitation Approved, with 1 year parts and labor, 5 year compressor warranties. The chilling process will take product from +194°F to +37°F in 90 minutes. Freezing will take product from +194°F to 0°F in 240 minutes.